Previous exhibitions of the Hudson Museum’s culturally diverse collections centered on presenting one culture area per exhibit. The Museum’s collections are extraordinarily rich, but are not comprehensive. To use our collections to their best advantage, the new World Cultures Gallery—the centerpiece of the Museum’s exhibitions—presents the richness and breadth of the Museum’s holdings. It features objects that have never been on public exhibition, and allows the Museum to exhibit a greater percentage of its holdings. The gallery consists of eight large-scale display units, including one devoted exclusively to the William P. Palmer Collection III collection of Precolumbian artifacts. 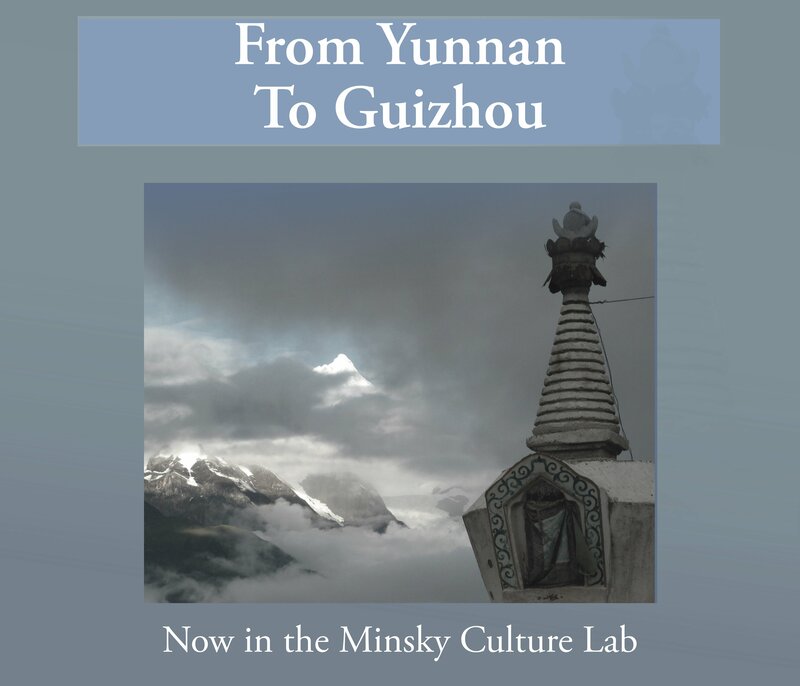 Each exhibit case focuses on a specific cultural theme universal to people around the world. Visitors will be able to compare and contrast how people from a variety of cultures are similar and how they are different; how they solve basic issues; and how their environment affects their solutions. Themes featured in the gallery include ritual and belief, status and power, home and family, transportation, adornment, foodways, and objects made for others. For example, a case devoted to status and power displays Northwest Coast Chilkat robes and tunics; African stools, staffs, and ancestor figures; a Phase III Navajo Chief’s blanket and Southwestern jewelry; and Precolumbian pottery figurines of nobles, rulers and the elite. The Native people of Maine have legends that tell of how the Creator made a being, Gluskabe. Gluskabe made the people and taught them how to respect and use the natural resources of their world, especially the trees and plants. He showed them how to make baskets, birchbark containers and canoes, and how to carve. 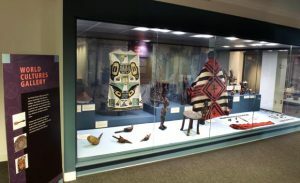 Among the Hudson Museum’s holdings are over 500 examples of the material culture of Maine’s Maliseet, Micmac, Passamaquoddy, and Penobscot peoples and hundreds of historic images. This assemblage includes brown ash splint and sweet grass basketry dating from 1850 to the present along with an important collection of basketmaking tools and molds, birchbark containers and implements, rootclubs, crooked knives, snowshoes, beadwork, and three full-size canoes. 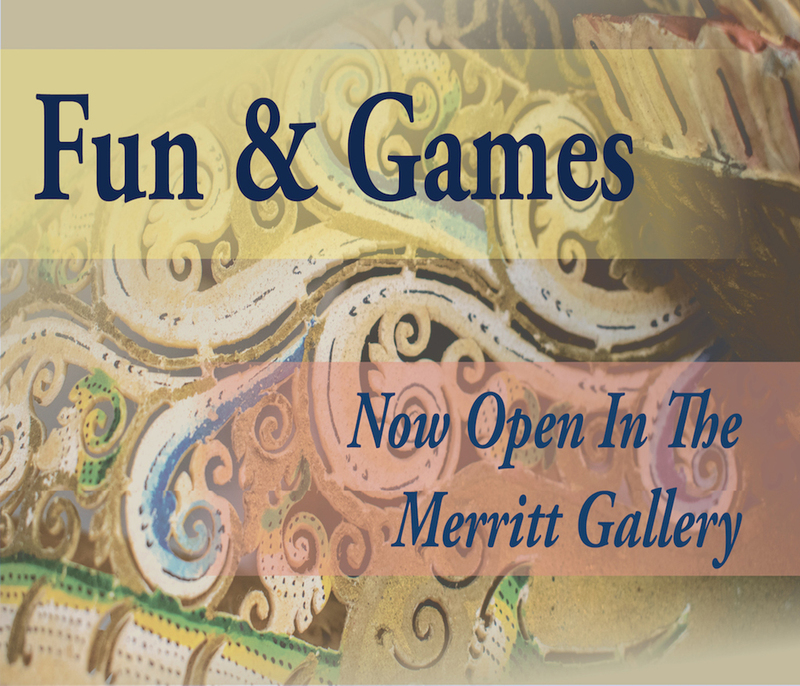 These objects, and collections on loan from other Museums in New England, are presented in this new exhibit, together with audio and video footage of fourteen contemporary Maine Indian artists who are masters of their traditions. The film footage documents how raw materials are gathered, processed and prepared, and how each of the artforms is made. These film segments are available to explore in two Native Voices kiosks. Across from the presentation of Maine Indian material culture, UMaine researchers will present their research and collections. These collections have rarely been exhibited to the public and until now have been used almost exclusively for research. 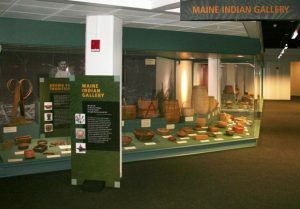 This portion of the exhibit includes artifacts gathered by UMaine archaeological projects and housed in the collections of the Anthropology Department. Points, scrapers, adzes, awls, or potsherds from a wide variety of archaeological sites may be found as well as evidence of the Ice Age in Maine. In addition to the archaeological collection, a time lapse presentation will be created, which will show the glaciation of Maine during the ice age, the receding of glaciers and the appearance of land, the types of vegetation and animal life that developed in the state, the changing of plant and animal species over time, and the peopling of Maine. This segment will also draw on research of the Climate Change Institute to assess the impact of these changes on our state. The multimedia segment will show not only Maine’s past, but how climate change will shape Maine 500 years from now.